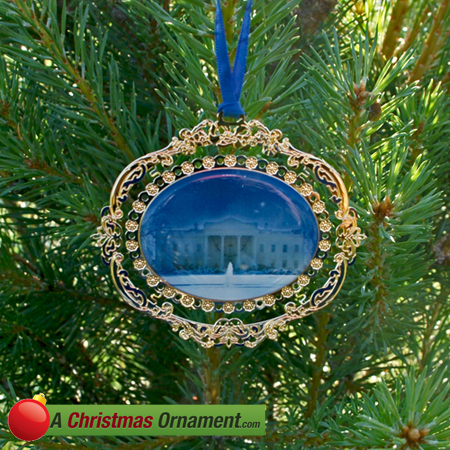 Christmas Ornaments Made in USA - 2010 White House North Portico Ornament - A Christmas Ornament Co. Consistently high rankings of the White House appears on American Institute of Architect’s “America’s Favorite Architecture” in Washington, DC. The North Portico of the White House is often referred to as “the President’s entrance,” and can be seen on the official White House logo. The portico was added in 1830 and was built in accordance with the original architectural design. The President’s home is owned by the National Park Service and therefore the U.S. citizens. The North lawn is the landing site for the presidential helicopter Marine One.